The largest town on the Zuni Reservation is Zuni Pueblo. Most of Zuni's residents live in the main village of Zuni and the nearby community of Blackrock. Zuni Pueblo is also known as Halona:wa Idiwan'a, or the Middle Place, and has been continuously occupied since at least 700 CE. It is considered one of the most traditional of the surviving Pueblo communities, retaining a unique language, culture, and history. Prior to using the current pueblo community as their tribal seat, the Zuni people lived at Hawikuh, an ancient pueblo that was considered one of the Seven Cities of Cibola by the early Spanish conquistadors. "Zuni Pueblo," by Marion Grace Saunders. Marion Grace Saunders Pictorial Collection (2011-002-b5-f4-0003). Center for Southwest Research, University Libraries, University of New Mexico. 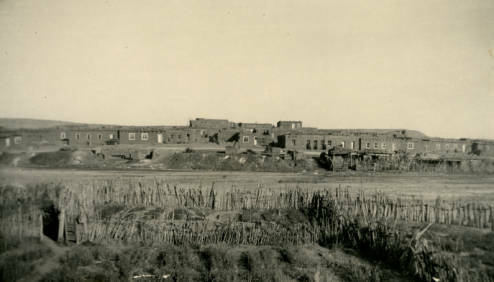 1999 Pueblo of Zuni. http://www.ashiwi.org/, accessed July 9, 2014. N.d.d Zuni Pueblo Today. http://www.zunitourism.com/, accessed July 9, 2014.